Enhance awareness of our region’s assets. Position the region competitively for the retention, expansion and attraction of jobs and investment. Assist companies from outside the region to find the best location in the Radius region for their needs. Support local communities through development programs to help entrepreneurs, start-ups and existing businesses succeed and grow in our region. Serve as the lead information broker, providing the most accurate and up-to-date data on the region. Work with regional communities to support local initiatives that improve and maintain quality of place. Throughout the year, the Radius Indiana team hosts, visits and responds to site selection advisers and corporate decision makers throughout the United States. Radius Indiana provides a central location for site selection needs. We offer custom searches and site tours, comprehensive up-to-the-minute data, contacts to local, regional and state organizations, and access to gap funding for regionally beneficial programs. 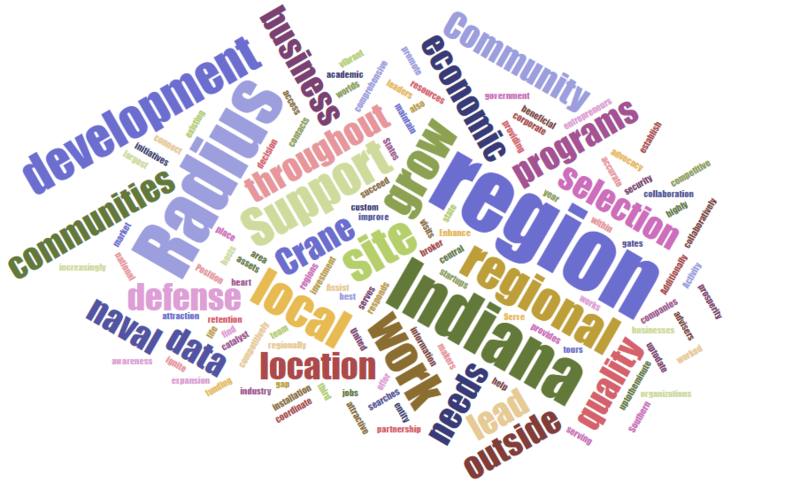 Additionally, Radius Indiana works to grow our defense and national security industry by serving as the lead economic development entity outside the gates at Naval Support Activity Crane, the world’s third largest naval installation. We also work to grow advocacy, connect the community, and coordinate defense resources for Crane within our region. Radius Indiana serves as a regional catalyst for government, business and academic collaboration to market and promote the area as a highly competitive, vibrant region with an increasingly attractive quality of life. Community and business leaders have worked collaboratively with the Radius region to establish an economic development partnership at work for our region to ignite prosperity in the heart of Southern Indiana.